The assassination of the brother of North Korean leader Kim Jong Un this week followed publication of a plan to use the relative in an information warfare operation for regime change in Pyongyang. Kim Jong Nam, the half brother of North Korean dictator Kim Jong Un, was killed Monday in Malaysia after poison was sprayed in his face by two women in an operation that had the markings of a North Korean intelligence operation. Authorities in Malaysia have arrested three people for their roles in the attack, which was captured on airport surveillance video. North Korean diplomats attempted to recover the body of Kim Jong Nam this week and demanded an immediate cremation, in an apparent bid to prevent Malaysian authorities from identifying the cause of death. The Malaysians rejected the request. The assassination came as a recently published book by this writer, iWar: War and Peace in the Information Age, called for waging an information warfare campaign that would use the estranged brother of Kim Jong Un as a replacement leader. Since taking power in 2011 following the death of his father, Kim Jong Un has ruled with an iron grip while carrying out ruthless purges of perceived opponents. As many as 300 officials have been killed in the purges, including Kim's pro-China uncle, Jang Sang Taek. 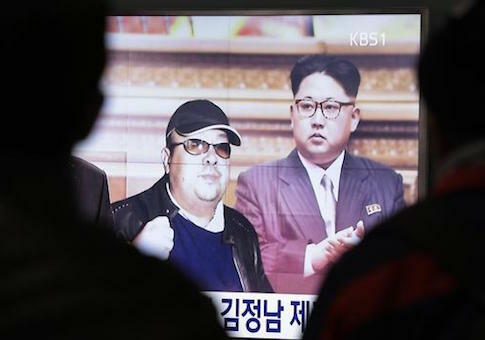 Kim Jong Nam, 45, at one time was considered the heir to the late Kim Jong Il, but he ran afoul of the Pyongyang communist family dynasty after his 2001 arrest in Japan for entering the country using a false passport to visit Tokyo Disneyland. As the Wall Street Journal noted in an editorial, Kim Jong Nam was viewed as a threat to the Kim Jong Un regime because of past comments criticizing the North Korean system. "North Korea should pay attention to reform and openness. If it continues like this, it cannot become an economic power," Jong Nam was quoted as telling a Japanese newspaper in 2011. Jong Nam also opposed the dynastic communist system, which he said "does not fit with socialism and my father was against it." He also was close to his uncle Jang, who was executed in 2013, allegedly for corruption but more likely for his close ties to the Chinese. Jong Nam's support for Jang is an indication he favored the reform communism of China over the Stalinist North Korean model. North Korea's regime is engaged in what the United Nations Commission on Human Rights several years ago called crimes against humanity. The regime uses systematic torture, mass extermination camps, and other ruthless means against the North Korean people in a bid to maintain its grip on power. The assassination comes as the Trump administration is reviewing North Korea policy. The book iWar called for the United States to adopt a policy of regime change in North Korea. "North Korea is an enemy because it has armed itself with nuclear weapons and missiles while repeatedly threatening to use those weapons against the United States and its allies," the book stated. "The center of gravity for North Korea is the Kim dynasty." The policy calls for providing North Korea with large numbers of information systems, such as computers and smart phones. The wiring of the police state initially will be limited by regime controls, but eventually North Korean citizens will find ways to circumvent the electronic controls. Once that takes place, information operations will be able to penetrate the totalitarian system, expose the horrors and crimes of the regime, and lead to reform and ultimately the ouster of the Kim regime. "The program will include coopting Kim Jong Nam, the out-of-power brother of North Korean supreme leader Kim Jong Un, and conducting information operations that will seek to install the brother as a replacement for the current leader," the book states. Any link between the book's publication Jan. 3 and the assassination of Kim Jong Nam in Malaysia six weeks later is speculative. The connection should not be discounted, however, considering Kim Jong Un's ruthlessness and paranoia. Since taking power, Kim has sought to eliminate challenges to his rule. Kim Jong Nam, as a family member of the ruling Kim dynasty, represented a threat to the dictator's quest for unrivaled power in Pyongyang. Bruce Bechtol, a former Defense Intelligence Agency specialist on North Korea, said the regime targeted Kim Jong Nam because he criticized his brother's rule. The regime issued a "warrant" to kill Jong Nam in 2012, he said. "I think this was a window of opportunity; he was outside of Chinese territory and thus the Chinese could not protect him; he was without any of his own personal bodyguards, which is curious; and he was in a very confused setting," Bechtol said. "Thus, this was the perfect window of time for the North Korean agents to take him out." Greg Scarlatoiu, executive director of the Committee for Human Rights in North Korea, said the killing appears linked to North Korean hereditary leadership. "The assassination of Kim Jong Nam ensured that another hereditary transmission of power would not happen in the foreseeable future," he said. The assassination also appears intended as an intimidation tactic for other North Korean leaders. "It also sent a stark message to senior North Korean officials inside as well as outside North Korea: Now that even Paektu blood has been spilled, no one, absolutely no one is safe," Scarlatoiu said. Mount Paektu is considered the spiritual home of North Koreans. The ruling Kim family, beginning with communist North Korean founder Kim Il Sung, then Kim Jong Il, and currently Kim Jong Un regard the "Paektu blood line" as the dynasty's legend. South Korea's intelligence chief told lawmakers in Seoul this week that Kim Jong Nam had been under threat for years, and that an earlier assassination attempt in 2012 was thwarted by Chinese police. "We should not place too much significance on the timing of the assassination. It was the execution of a standing order that was issued a long time ago," National Intelligence Service chief Lee Byung Ho was quoted as saying. "Rather than a calculated move under the perception that Kim Jong Nam is a threat, it appears to be a reflection of Kim Jong Un's paranoid characteristics." North Korea watchers in South Korea said the assassination was unusual since Jong Nam was vulnerable for years, but had not been killed despite a direct order from Jong Un five years ago. "There is the possibility that Kim Jong Nam tried to defect and that Kim Jong Un killed him to prevent that from happening," Chung Sung Jang, an analyst at the Sejong Institute in South Korea, told the Chosun Ilbo. By protecting Kim Jong Nam, who lived in Macao, China was sending a power signal to North Korea that it was capable of undermining and ultimately defeating Kim Jong Un's rule. The killing of Kim Jong Nam is the latest sign of insecurity and instability in the increasingly dangerous regime in North Korea. The attack is not a surprise in light of the North Korean regime's ultimate objective: not just the maintenance of a communist system, but the preservation of the personality cult of Kim Jong Un. According to Malaysian police, on Monday two female assassins accosted Kim as he walked through the departure area of the airport in Kuala Lumpur Airport for a flight to Macao, where he had been living in exile. The attackers sprayed a chemical in Jong Nam's face apparently containing a poison that killed him before emergency medical personnel could deliver him to a hospital. Malaysia's police chief, Khalid Abu Bakar, said in statements that police first arrested Doan Thi Huong, a 28-year-old Vietnamese woman, on Wednesday. Doan was seen in surveillance video at the airport wearing a shirt with the letters "LOL." A day later, police arrested a second woman, 25-year-old Siti Aishah, and her boyfriend, Muhammad Farid Jalaluddin. Both are Malaysian. Reports from Malaysia say authorities suspect four men were involved in the plot who have not been arrested.